You are here: Home / Massage / Whole Body Massage / What Does It Feel Like To Have Fibromyalgia? Putting it simply, fibromyalgia is a long-term medical condition that causes pain all over the body. It is a lifelong condition that affects around 5 million Americans. People who generally suffer from this condition experience sore and stiff muscles. Although the condition isn't critical as it doesn't damage the joints or organs permanently, it can be considered an irritating condition as people suffering from it experience constant aches and fatigues that prevent them from performing menial tasks and errands. Well, even medical experts have yet to pinpoint the exact cause of fibromyalgia. However, many believe that the condition is related to the imbalance of particular chemicals in the brain. Many experts also believe that people are more likely to suffer from the condition if their parents suffer from it. The condition is usually triggered by a physically or emotionally stressful activity. And, some of these activities/events can include an injury, infection, the process of giving birth, having an operation, a relationship breakup, and the death of a loved one etc. Who suffers from the condition the most? It is possible for anyone to develop fibromyalgia. However, women are 7 times more likely to develop the condition. And, the condition usually starts developing between the ages of 30 and 50; it can also occur in people of any age, including the elderly and children. According to reliable sources and reports, around 1 in 20 people suffer from fibromyalgia to some degree. It is difficult to estimate the exact number of people affected by the condition as fibromyalgia is extremely difficult to diagnose. Despite the medical advances made over the years, there´s yet no cure for fibromyalgia. Fortunately, there are treatments to help relieve some of the symptoms. There are treatments that make the condition bearable. Some of the treatments prescribed by the doctors usually comprise of processes such as talking therapies (cognitive behavioral therapy and counseling), the consumption of medication (antidepressants and painkillers), fascia blasting, lifestyle changes such as exercise programs and relaxation techniques. If you suffer from fibromyalgia, you have to make adjustments in your life, from work to parenting to household chores to having fun. If you take a more active role in managing your condition, you will be able to feel a sense of control that can, in turn, boost your self-esteem and thus, improve your quality of life. People suffering from the condition should be as active as they can. Regular exercise eases both pain and fatigue. Therefore, if you want to cope well with the condition, you shouldn´t skip your swimming sessions and walking routines. If you want to feel steadier, you can consider performing balance exercises. If you want to boost your strength and overall fitness in general, you should undergo resistance training. If you are uneasy on your feet and can´t even perform a low-impact activity, you should ask your doctor to formulate an exercise program specifically for people with fibromyalgia. Regular exercise can help you improve your strength, flexibility, and stamina. It is essential for you, as a fibromyalgia patient, to concentrate on only eating nutrient-rich foods that give you plenty of energy. You can also keep a journal to identify the foods that help make you feel good about yourself. People who suffer from the condition generally have low levels of vitamin D.
The deficiency can, in turn, play an atrocious role in worsening the pain and other symptoms. Hence, you must include vitamin D-rich foods in your diet as well. It is also suggested for you to avoid caffeine as much as possible. Although the caffeine can make you feel more alert, it can also put you on edge and make it more difficult to get some sleep. Stress has been identified as one of the main triggers of the condition. Stress also largely drains your energy too, adding to the fatigue already caused by the condition. Therefore, it is also essential for you to deal with stress properly. You can practice mindfulness meditation and other practices such as qi gong, tai chi, and yoga. Practicing such mind-body exercises can help you focus your thoughts in a positive manner. What are some of the symptoms of fibromyalgia? Can the pain of fibromyalgia come and go? People who suffer from fibromyalgia typically have widespread pain all over the body. Unfortunately, that is not where their suffering stops. Additionally, they may also experience increased sensitivity to pain, muscle stiffness, fatigue, irritable bowel syndrome, headaches, problems related to mental processes, and can have a tough time going to sleep. The pain caused by the condition is particularly severe in the morning. And, yes, the pain comes and goes from various areas of the body with no apparent rhyme or reason. How to explain what fibromyalgia Feels like? As we stated earlier, people with fibromyalgia ache all over. The ache can be deemed similar to bursitis, tendinitis, and osteoarthritis. 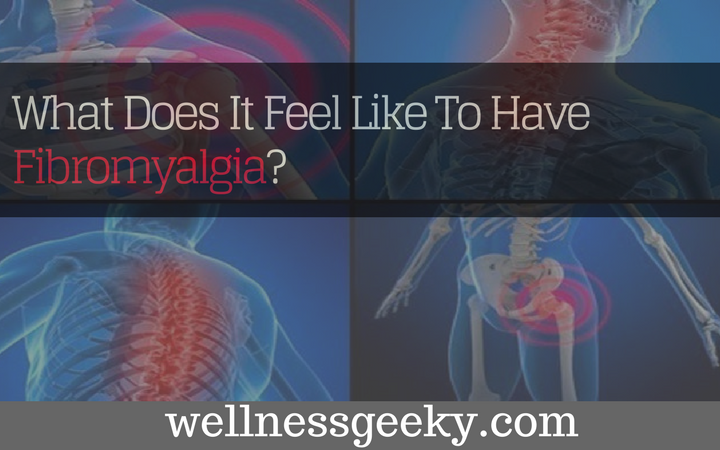 However, unlike the aforementioned conditions, the pain of fibromyalgia is felt all over the body. And if we are to describe fibromyalgia pain, the pain can be sharp, dull, deep, throbbing, or aching. You can feel it in your tendons, ligaments, muscles, and around the joints. For some people, the pain comes and goes. It could also travel throughout your body. It is also completely possible for you to have tender points—particular points around your joints that hurt when pressure is applied. For instance, if you apply pressure to the tender point of a person who doesn´t suffer from fibromyalgia, the person simply feels pressure. However, when the same pressure is applied to a person suffering from fibromyalgia, the pain would be unbearable. These tender points are usually located in predictable places on the body and they can be found under the surface of the skin. In most cases, it is the tissue around the muscles and joints that hurt rather than the joints themselves. How do you get tested for fibromyalgia? And, what are the 18 tender points? Diagnosing fibromyalgia is no walk in the park. However, it is not impossible for the doctors to diagnose the condition. Medical experts usually check for particular tender points (18 of them) on the body, and identify if the tender points cause pain when pressed. These 18 tender points are located on the front and back of the neck, elbows, hips, lower back, knees, upper back, shoulders, and chest areas.